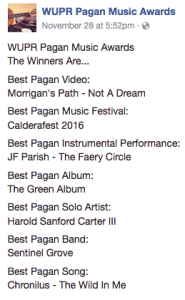 Chronilus Wins WUPR Pagan Music Award! The Wild in Me Wins Best Song of 2016, as voted by listeners of WUPR-DB United Pagan Radio, on the first-ever Pagan Music Awards!! Chronilus Plays New Year’s Eve Time Bender in Redmond, WA → ← Chronilus is coming to Boomfest!